It is often stated that once you look through a Double Stacked Solar Telescope, you don’t ever want to go back to Single Stack. However, what is Double Stack and what are the benefits of having a Double Stacked system? There has been significant chatter on Lunt Social Media and e-mail lately regarding Doublestacking, and it’s definition and specification. This three-part blog goes into some technical details regarding how double stack systems are different than a single stack system. A single narrow-band Etalon filter utilized in the Telescope. Typically with a bandpass of 0.7 – 1.0Â Angstroms (FWHM). 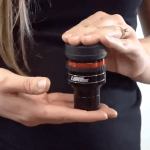 Double Stacking: The addition of a secondary narrowband Etalon filter into the telescope in order to reduce the bandpass of the system and increase contrast. Typically the bandpass is reduced to less than 0.5 Angstroms. “Doublestack” like performance from a single etalon system: I cannot answer to this statement given that I have seen no data or specifications to back up the claim. If this system has 2 Etalons, it would be Doublestacked per the implied definition. Off course it is possible to compare a single system to a dual system if the dual system had wider bandpass etalons, i.e.,>1 Angstrom. My advice is to compare the actual specifications and not “taglines”. The specification of the etalon as taken at the FWHM of the measured transmission. FWHM: Full-Width Half-Maximum of the measured transmission curve. This measurement is made at the 50% point of the height of the overall transmission when measured from the zero to the full transmission point. NOTE: It should be noted that Etalons are not transmission filters, they are Interference filters. Typically a secondary filter (Doublestack filter) will reduce the bandpass from 0.7 Angstroms to <0.5 Angstroms as measured at the FWHM. When specifying a Doublestack system (DS) vs. a Singlestack system (SS) It is essential to look at the specifications provided and understand the related specifications that are generally NOT provided. These specifications should be consistent across the entire clear aperture of the filter. Etalons are extremely precise optical systems. They are very susceptible to uniformity issues across their apertures resulting in MAJOR performance issues. A filter with a specification of 0.5 Angstroms (FWHM) at 6562.8 Angstroms (WL) through the center is pretty useless if the outer portion of the etalon has a specification of 0.5 Angstroms at a shifted WL of 6562.4 Angstroms. (a delta of 0.4 Angstroms) This shows un-uniformity of the etalon that results in a much wider BandPass (BP) than specified. An etalon that has a 0.4A bandpass shift as measured across the aperture has an overall bandpass that is 0.4 Angstroms wider. (Solar Telescopes typically use almost the entire aperture of the etalon). In the next installment of this blog, I will discuss the uniformity of the etalon plates, what to expect from a single stack system, and the high transmission at the peak wavelength.